Tottenham Hotspur will be looking to record back-to-back Premier League wins for the first time this season when they entertain Sunderland on Sunday afternoon. 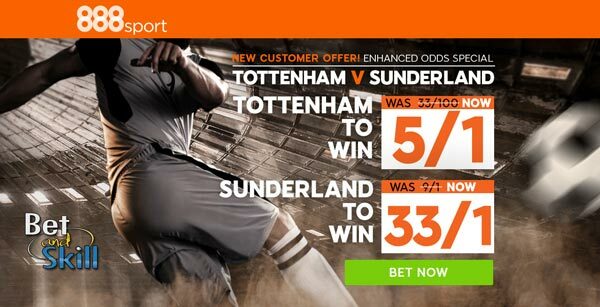 Don't miss our Tottenham v Sunderlandbetting preview with predictions, betting tips, probable line-ups, team news, best odds, special offers and no deposit free bets on the match! 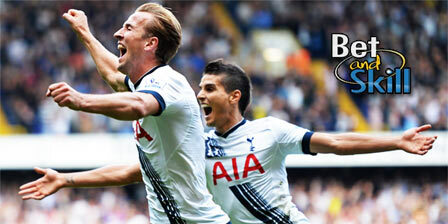 Tottenham have started their league campaign with 2 draws, and 2 wins and sit 5th on the log with 8 point from 4 games. After an impressive 4-0 success at Stoke City, Spurs slipped to a disappointing 2-1 defeat when they hosted Monaco at Wembley Stadium in midweek. The welcome of Sunderland is the ideal opportunity for Spurs having won their last five home league meetings with the Black Cats. Mousa Dembele is likely to make his first start of the season after returning from suspension. Danny Rose needs another week to recover from injury, with Ben Davies in line to keep his spot at left-back. Jan Vertonghen and Toby Alderweireld are expected to keep their spots at the heart of the defence. Erik Lamela may start on the right, although Moussa Sissoko is also a viable option in that position, with Dele Alli perhaps operating in the number ten role. Vincent Janssen is pushing for a start upfront, though he should feature from the bench. Sunderland are currently joint-bottom of the Premier League having taken just one point from a possible 12 this term. They enter this match on the back of a 0-3 home defeat to Everton, when David Moyes' defense conceded Romelu Lukaku a hat-trick. Their only point so far arrived two weeks ago against Southampton (1-1). The Black Cats narrowly escaped relegation last season, but unless there is dramatic improvement they will not avoid the drop to the Championship this time around. David Moyes is without quartet Sebastian Larsson, Vito Mannone, Fabio Borini and Billy Jones through injury. Victor Anichebe is still short of match fitness and will be benched. Jason Denayer could make his first start alongside Lamine Kone and Papy Djilobodji in a three-man backline. Adnan Januzaj could play off Jermain Defoe in attack, with Duncan Watmore or Wahbi Khazri perhaps only starting should Moyes decide upon a 4-2-3-1 or 4-3-3 system. Sunderland (3-5-2): Pickford; Denayer, Konè, Djilobodji; Manquillo, Van Aanholt, Ndong, Kirchoff, Gooch; Januzaj, Defoe. "Spurs v Sunderland predictions, betting tips, lineups and odds (Premier League - 18.9.2016)"